Australian Technology Park 2 Locomotive Street, Redfern, NSW, Australia. Register Online for your $2 entry fee by Thursday 11th August. Otherwise tickets are $15 online & on the door. 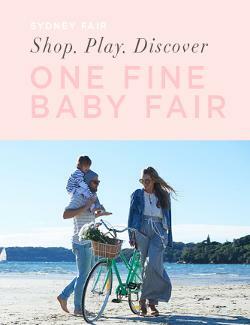 The annual One Fine Baby event returns to Sydney at The Australian Technology Park, Eveleigh, 12 - 14 August 2016. Recognised as Australia's premier retail destination for design-led family and lifestyle products, the exhibition welcomes an outstanding, curated line-up of over 100 carefully-selected brands (including Joolz, Incy Interiors, Olli Ella, Bella Buttercup and many new designers) in baby and child related industries under the one roof. Register every family member here for your $2 entry on the door. Whether you're planning for the arrival of your little one or here to have a great day out with entertainment like the Ben and Holly Stage show, you're in for an amazing day out. As a VIP ticket holder you will be greeted by a glass of champagne and roaming canapes on arrival followed by 1.5hrs of exclusive access to OFB stall holders to shop before being seated for the inspiring guest panel. One Fine Baby's VIP night offers ticket holders exclusive access to guest panel speakers including Natalie Bassingthwaighte, Jules Sebastian, Kate Ritchie, Kyly Clarke and Business Chicks' Emma Isaacs. Each will tell their personal tales and triumphs in an intimate setting designed to inspire us to make the best version of ourselves. These interviews will all be set to inspire you in areas of style, health, beauty, interiors whilst juggling work and children and having one amazing crack at life. Gracing the main stage on our VIP night will also be Interiors Addict's Jen Bishop who will be chatting with Australian design sweethearts: Chloe Brookman from Olli Ella, Kristy Withers from Incy Interiors, and the 'tale of the tulle' with internationally celebrated fashion designer of Tutu Du Monde, Andrea Rembeck. These creative visionaries share the secrets of interior styling and educate on how they put that magical touch on any room, photo shoot or party. Michelle is Australia's favourite personal trainer and has recently become a new mum to a beautiful baby boy named Axel. She is also an author, TV personality and the resident trainer on the Australian version of The Biggest Loser. Spend an hour in an intimate talk with Michelle Bridges, and hear about her latest book 'Making It Happen' which was just released. An afternoon with Tizzie Hall - sleep consultant & Author of 'Save our Sleep' will commence once the doors close on the Saturday afternoon. This will give new parents and parents with children who are having sleep issues to hear from the sleep whisperer herself. Tizzie Hall has been working with children for many years and boasts a long list of relieved parents (including us!) who have been helped with customised baby sleep solutions. The afternoon will consist of a 1hr workshop and a 1hr Q&A and the opportunity to get your Save our Sleep book signed by Tizzie. Register Online for your $2 entry fee by Thursday 11th August. Otherwise tickets are $15 on the door.